The butterfly is an origami one... Very simple n easy to make, tied it with a satin ribbon to make the antenna. I have this 'girlhood' paper stack from lulupu... n I use it for most of my projects.... Very versatile. I have added gem stones for sparkle n dimension. I made this card in flat 10 minutes. Hope u liked it. That's it from me. Thanks for visiting my blog. beautiful card ..n that origami butterfly is awesome...!! 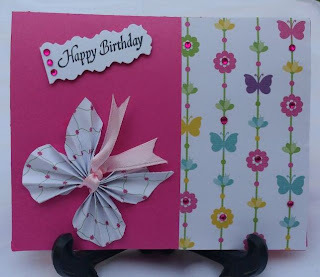 Hi Sujana, what a gorgeous butterfly and a lovely card. Beautiful - the butterfly is so elegant. 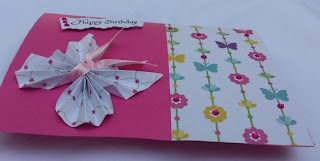 Oh wow, what a beautiful origami butterfly to embellish the card! Thanks for joining us at CAS-ual Fridays Challenge! I love how you made the butterfly! What a great handmade embellishment! The patterned paper looks perfect with it. Thanks for joining us at CAS-ual Fridays! love the origame butterfly!! lovely card! thanks so much for joining us this week at CAS-ual Fridays Challenge!